Please join me in welcoming today’s guest blogger, Cindy, who shares with us a fabulous collection of quilts from the Irish Patchwork Society exhibit in Dublin. P.S. You can click each image to see it BIG. If you think of a quilting mecca, I am sure Ireland is not the first location to jump into mind. Maybe it should be. 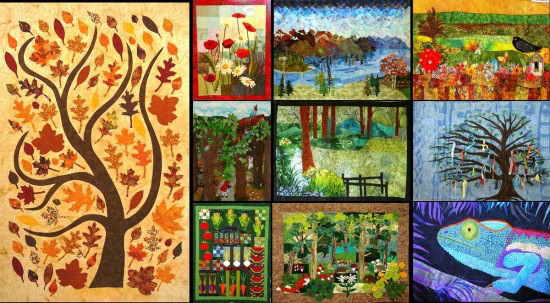 We have a wealth of talent ranging from traditional patchwork and appliqué to art quilters to incredibly talented modern artists who inject a new twist into patchwork. The Irish Patchwork Society is currently hosting a national exhibit in celebration of their 30th anniversary at the Botanic Gardens in Dublin. The theme of the exhibit, Branching Out, highlights the eight branches of the organization throughout Ireland. I thought this may be a fantastic opportunity to underscore the incredibly active community of quilters we have in Ireland. 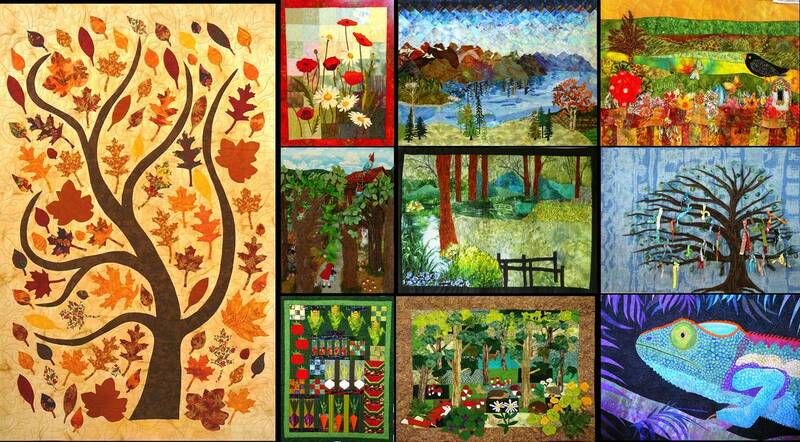 Exhibited is a vast array of traditional patchwork and appliqué quilts incorporating a range of beautiful fabrics from solids to batiks. Several of these quilts adhered to a natural theme by using flowers or leaves as the center of the block. I need to underscore the beauty of the quilting in these pieces, a characteristic of these quilts that is often lost in the photo. Several of these were hand pieced and/or incorporated hand dyed or painted fabrics. They were incredibly detailed and took my breath away. To balance the lines and points of the traditional quilt, there were exquisite art quilts scattered through the hall. 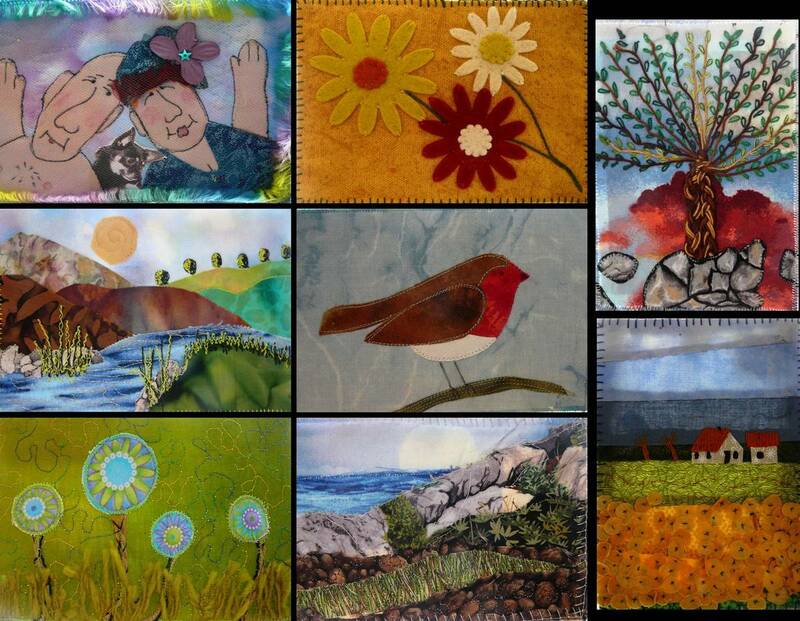 Again, with great emphasis on nature and Irish landscape, these quilts added a spot of color, interest and whimsy. Personally, I think that these art quilts truly exemplify the talent of our local quilters as well as the incredible beauty of our island. Notice the freshness of the flowers, the straight cooling trees, the blue water and the abundance of wild life. This, I think, is where Ireland was best captured. A unique part of this exhibit was a hall dedicated to hand made, quilted postcards. Sadly, each of the cards was displayed such that the artist’s name (on the reverse side) was not visible to the visitor. However, they were grouped by the artist’s nationality, drawing attention to the variety of people living in Ireland. Each postcard was beautiful and distinct. I could not help but think that receiving something like this in my post box would truly make my day. Postcards – Unidentified international artists. Although it was not incorporated into the exhibit, modern quilters are ubiquitous in Ireland. This is a whole new generation of quilters located throughout the country that is gaining momentum at a rapid pace. Often based on traditional patterns and/or incorporating traditional skills such as appliqué, these quilters choose brighter, more modern fabrics as a focus of their design. Please know that for each of the National Exhibit quilts I have highlighted here, there are ten additional quilts of equal beauty. It is only due to the limited space of this blog and my time in writing that they are not included. Quilting in Ireland has something to offer everyone. Maybe have another look at the Quilting Gallery’s list of eighteen Irish Bloggers. You are bound to find a new quilter whose work gets your heart a-flutter. Cindy is a quilter living in Ireland. She regularly writes of her quilting successes and mis-adventures in her blog, Fluffy Sheep Quilting. You can contact her via email at fluffysheepquilting(at)gmail(dot)com. Sorry that my package did not arrived at destination. I sent it almost 2 months ago ‘. Now I am in Brazil, but I can make another in September, when I return in Italy. Excuse me with my combination. Sand me a mail please!!!! I love the display from Ireland and too bad the hand quilting doesn’t show in the pictures because I am sure it is exquisite. Such pretty quilts! And I love the postcards. Thanks for sharing this exhibit with us!